Real Estate email newsletters are a great way to stay in contact with your prospect clients and keep your current clients up to date on your business and the real estate market. The thought of getting an email newsletter going may be overwhelming, but it doesn’t have to be. DeliverySuccess has Stock Real Estate Templates for only $10.00! Custom templates, by the way are only $30.00 at DeliverySuccess. 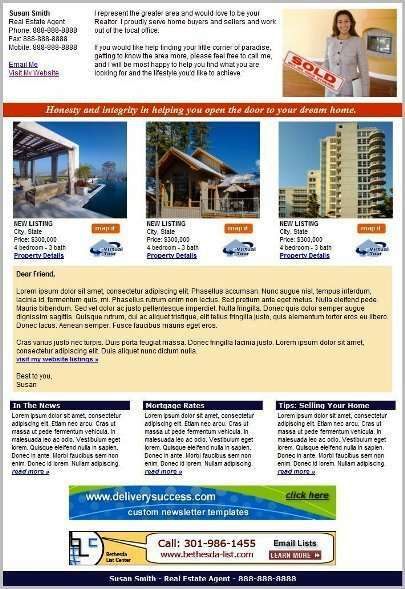 At DeliverySuccuss you can create your FREE email newsletter using their FREE email editor with image hosting. All templates are specially coded for higher email deliverability and click-through rates. -Compatible with Constant Contact, Exact Target, Lyris, ReachMail, Outlook and more.